In the last fifty years, the worlds of accounting and finance changed dramatically, mostly due to two factors: regulation and technology. I’ll leave the regulation part of out of this discussion for a later time, but the technology aspect is fair game for us. In the old pre-computer days, the accounting and finance professions had to do everything by hand. To calculate the revenue of a company, you couldn’t just use a SUM function, you had to manually sum up all of the individual numbers with a calculator and a pen in hand. As you could imagine, mistakes were made often, and very difficult to find. Enter computers and information systems. Digital spreadsheets such as VisiCalc, Excel, and QuickBooks came into existence, making the lives of number-crunchers phenomenally easier. One benefit of spreadsheet software was that you didn’t have to manually write everything out. Spreadsheets were efficient, in every academic sense of the word. Another was the timeless nature of digital records - they don’t expire with time (caveat: formats go out of style, and hard-drives fail, but compared to paper records spreadsheet software was a huge win for the profession). To be sure, ample negatives existed as well. It is potentially easier to get away with fraud since digital records can be easily deleted (especially if the fraudster is a member of management). But this post isn’t a history lesson. In fact, it is quite the opposite. I included the discussion above just to give you a little glimpse into how the accounting and finance professions changed in the past few decades. I think it is a fair assumption than to say that they will continue evolving in the next few decades as well. You do not need to be a erudite to see that both accounting and finance will be moving into the cloud. In fact, much of it already has. Most large companies keep backups (and original copies) of their financial data in the cloud, purchasing proprietary or off the shelf solutions (in the consumer space we call it a product, but in enterprise it is a solution) from companies such as Microsoft, Salesforce, Box, and countless others. The future of all data is in the cloud. That pontification was easy. But what about live, continuously updating financial information? Traditionally, management, investors, and other company stakeholders would request monthly, quarterly, and annual financial disclosures. These disclosures are heavily regulated by the PCAOB, SEC, AICPA, and countless other governmental and administrative agencies. The data often takes a lot of time to compile, since it’s housed in various locations, segregated to many employees, and needs to be audited before release. But what if this would be a nearly instantaneous and live process in the future? As often is the case with this blog, let me explain through example. You’re a manager and you want to know how many sales your business line made this week, how much you already received in cash, and how much is still due from customers who have not paid up yet. In most companies, this fairly simplistic analysis would begin with the manager (you) emailing an associate for the data, followed by the work being performed by the associate. This work could take anywhere from 10 minutes to a few days to complete, depending on the company. If it is a more tech savvy company, you might have access to “Business Intelligence” graphs and charts which allow for some quick, glance-able and manipulable data. But even at the tech savvy companies, instantaneous data isn’t common. Now imagine how accounting and financial information should be. As soon as a sale goes through, you can see the “Revenues” increase instantly, as well as a corresponding increase in “Cost of Goods Sold”. There is also a bar chart to show you sales trends over the past few days and months, that also gets continuously updated every time a sale is made. Continuing with our previous example, you can see that with every sale you make, your “Accounts Receivable” increases, as the customer owes you money on what they purchased and have not paid for yet. Every transaction that can be accounted for in the information system is accounting for in the system (this exists now). But every transaction is also categorized instantly, every account balance updated, every chart redrawn…everything is constantly up to date across the entire accounting system, which sits in the cloud. The data is simple to understand, quickly comprehensible, and immediately available for private and public consumption (imagine how happy investors would be). We got a man to the moon in 1969. We should be able to make one more giant leap, this time for accounting and finance, by 2020. 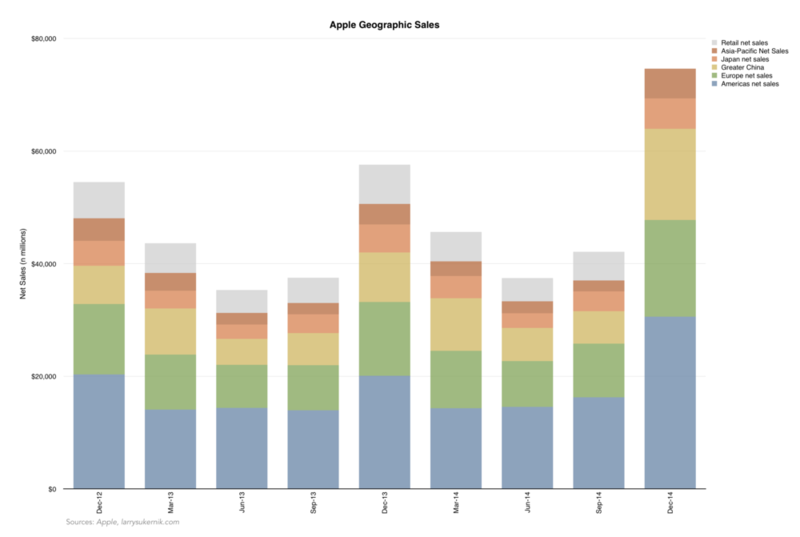 This post is divided into two sections: we start with a brief analytical look at Apple's historical financial data, followed by a narrative to describe the new products Apple will release in 2015. Companies cannot be analyzed solely by what's in a spreadsheet, which is why we will have to look at the big picture story of Apple too. 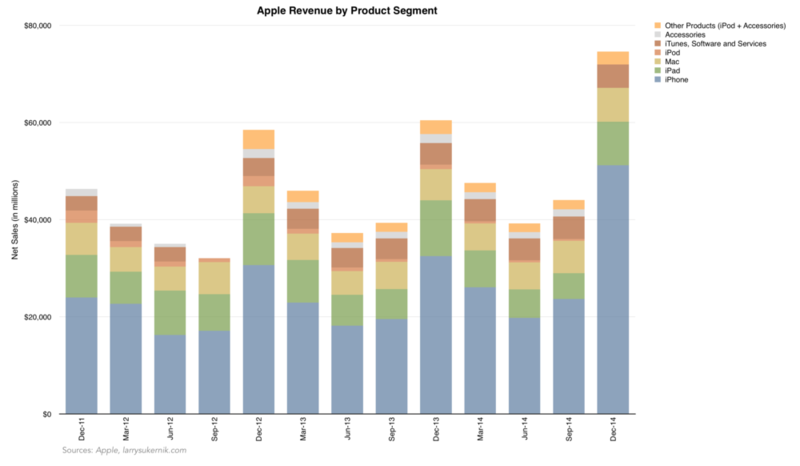 Every December (Q1 for Apple), we see revenues spike considerably. These sales spikes are helped by the holidays (October, November, and December are holiday months), but perhaps their most strongest contributor is the release of the latest iPhone every September. The iPhone 6 was the most popular iPhone yet. It finally appeased consumers who wanted larger screens, leading many Android users to switch to iOS. 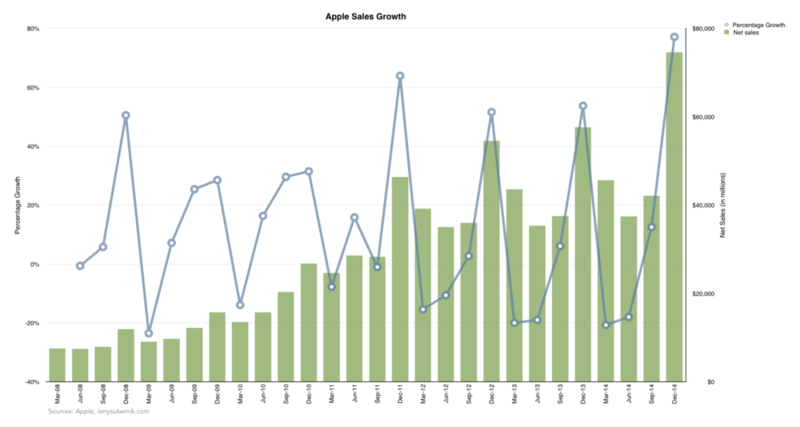 In December of last year, Apple had sales revenues of $57.5B. For this December’s numbers, I expect to see sales revenues increase to $67B (+17% from Q1 2014). There is a pretty clear trend with R&D spending. The lowest spending is in quarters ending in December, and the highest is for quarters ending in June. Given that Apple’s developer conference (WWDC) is in June, this makes a lot of sense. Apple is spending billions of dollars every year to announce its latest products in June so that developers can start getting ready to support the latest software and devices. As a percentage of sales, R&D spending seems to be slowly increasing. It hit highs of over 4% of net sales, with an average of 3% over the last five or so years. Compared to Google and Microsoft, Apple spends very little on R&D. It’s hard to criticize Apple, however, since they keep releasing great products every year. Apple is not the type of company to release experimental technology to the public, which is likely the main reason for relatively its low R&D costs. For example, Google sells beta products like Google Glass and Android TV which are expensive to develop, and are unlikely to become profitable products in the near future. Apple, on the other hand, has a history of releasing products ready for the consumer market which go on to become highly profitable. Profit margin, which is calculated as Net Income divided by Net Sales, is quite stable at 20%, bringing Apple roughly $20 in clean profits for every $100 they make. 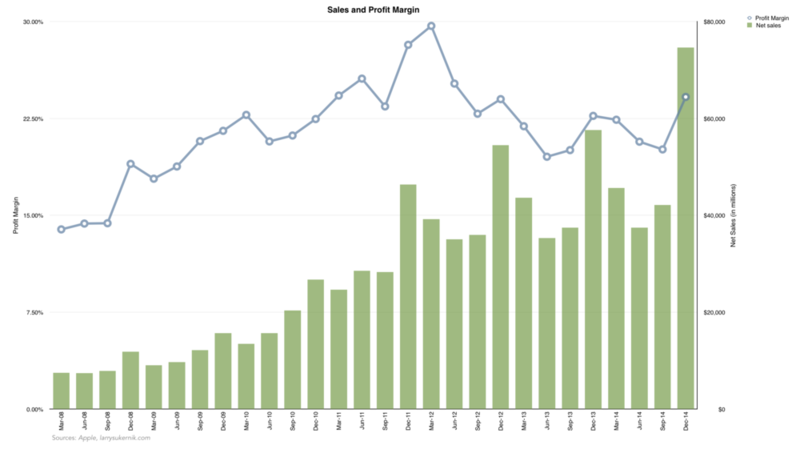 Behaving similar to net sales, profit margin usually peaks in Q1 (quarter ending December), since it is being aided by the excellent margins of the iPhone. I expect profit margin to increase in Q1 2015 since the iPhone 6 was offered in 16/64/128GB variants, opting many buyers to spend more for extra storage, resulting in even greater profits for Apple. Revenues. Apple will post its highest revenues ever this quarter, but success hides problems. Most of the revenues Apple makes comes from the iPhone, distantly followed by iPad, Mac, iTunes/Software/Services (I/S/S), and finally, iPod. iTunes/Software/Services and iPod contribute only a sliver of those revenues, and I don’t expect either segments to grow rapidly (I/S/S is growing unlike the iPod, but it’s not a primary revenue driver for Apple). Next, we have the iPad. As I’ve written before, the iPad did not take over the world as many expected, and it is dwarfed by iPhone revenue and sales volume. This leaves us with the iPhone, which is increasingly Apple’s strongest revenue-driver. This means that the revenues of Apple are predicated upon one product. In the investing community, it is a well-established axiom that diversification is key in order to “diversify away the risk”. I don’t believe the Mac, the iPad and I/S/S are enough diversification, since their combined sales are still lower than those of the iPhone. As a percentage of revenues, the iPhone ranges from 50–57% (it changes quarterly), while the iPad+Mac+I/S/S ranges from 39–42%. What will happen when the market for iPhone becomes saturated? Of course it is possible that the iPhone will continue selling admirably for years to come, but more likely than not, another product will enter the market and take away from iPhone (or all smartphone) sales. Apple should aim to be the creator of that future product, or diversify away the risk of being disrupted through additional products and services. New iPad and Mac? According to the credible supply chain leaks, we are likely to see an iPad Pro and a new Mac. I expect both of these products to be great, but it’s doubtful they will bring as much in as the iPhone does. The economics of the PC and tablet markets simply don’t allow for the immense subsidies that smartphones have. Moreover, smartphones are practically necessities all over the world. I challenge you to find a large portion of people who own a tablet but no smartphone. In short, these new products may boost revenues, but they won’t drive them. Apple Watch. I approach talking about the Apple Watch with caution. For a full analysis of it, read my piece from before. For this post, I will discuss only its effect on revenue. The reason for my caution is that nobody knows truly how large the market for smartwatches is or will be. Will people who wear watches now substitute them for the Apple Watch? What about people who don’t wear watches at all - will they buy one? Margins on the watch remain a mystery as well. We know that Apple will offer 3 tiers: Watch, Watch Sport, and Watch Edition. The cheapest model starts at $349, but the prices of the other two models is unknown, which says everything about my hesitance. From all accounts, the initial model of the Apple Watch will require an iPhone to connect to, further limiting its market. If you recall, however, the iPhone also needed a PC (Mac or Windows) to connect to, but it eventually became a standalone product. The Watch can plausibly take the same trajectory, and be the next revenue driver for Apple. Pessimistic Optimism. 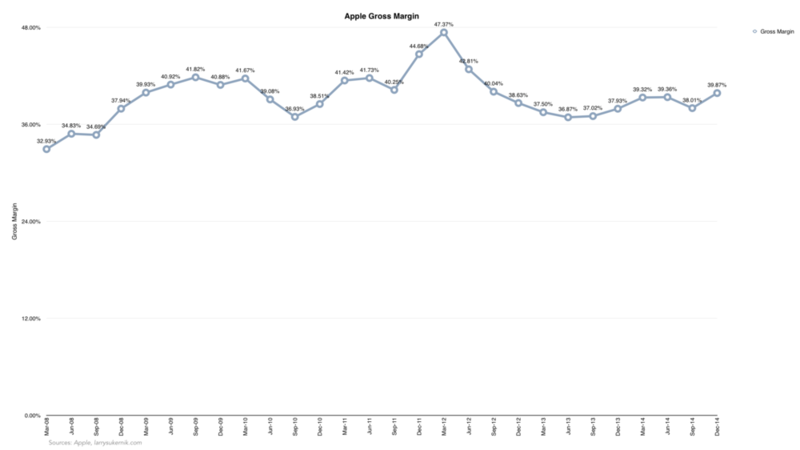 Apple is doomed is a cute aphorism to mean Apple isn’t growing as fast as before. While my thoughts from above may seem pessimistic, Apple is still a hugely successful company with great future potential. If I had to give this post as an elevator pitch, it would sound something like this: When you become as big as Apple, it’s hard to find markets that are large enough to make a a meaningful difference on revenues. That leaves Apple with two choices. Either find a large enough market, or diversify into a larger number of smaller markets. Which will it be? Most accountant's aren't very technically savvy, to the detriment of our profession. That's why in class, instead of paying attention to the professor (let's hope they don't read this), I sometimes let my eyes wander to see how my classmates take notes and solve problems. As you might have guessed, they use pencil and paper. If you're not an accountant, here's something you should know. We take lots of notes, and we need lots of scatchpaper. Don't get me wrong, I love the feel of my Pilot G-2 07 Gel Pen smoothly caressing the paper, but it's far from efficient. That's why I don't use paper and pencil to takes notes and homework problems. I am entirely paperless. My devices? An iPad for taking notes, and my Mac for everything else. The only alone time I get with my pencil is during exams, and that's because I'm forced to. So here are the devices and the applications I use. I open all the PDF slides my professors provide in PDF Expert, and sync them through Dropbox (everything I do is saved in cloud storage, but I'll leave that for another post). It's quick and easy, and let's me quickly markup documents. For those unaware, Numbers is Apple's version of Excel. It's less powerful, but much cleaner and quicker than Excel for basic calculations. I do all of my homework in Numbers. It lets me play with numbers and see how various things fit together (which is precisely what accounting is). It's like a digital scratchpad that never runs out. Unlike pen and paper, I don't have to scratch out or erase my errors, I can just delete them. Is my answer off by a few cents? No problem. I can quickly adjust the numbers to see which percentage gives me the correct answer. But the best feature of a spreadsheet program like Numbers is its support for formulas. For example, I can set "Income Taxes Paid" to equal the "Tax Rate" multiplied by the "Net Income/Loss", and it computes the answer in real-time. If I decide to change the "Tax Rate", "Income Taxes Paid" changes with it. Imagine doing that on paper. I keep all of my calculations saved in a workbook, with a sheet for each chapter, so that I can refer to the examples at a later time (like when I have to take the CPA, or more likely, before an exam). Numbers is more stable and appealing to look at than Excel, and I highly recommend it for any accountant/student who uses a Mac. An example of my Numbers spreadsheet. If you were wondering, I was calculating the Loss Carryforward and Carryback in this problem. Every accountant knows about Excel. It's a powerhouse application, and much more powerful than Numbers. That said, most accountants rarely, or likely never, need Excel's power-user features. I still use it for some classes, mainly when the teacher expects the homework in Excel format. It does exactly what I wrote about for Numbers, albeit in a less pretty way. The formula's are nearly identical to the ones in Numbers, so for those who are worried that everything they learned in Numbers won't translate to Excel, stay calm because it will. You'll definitely be using Excel at work, so it helps to get friendly with it. An Excel spreadsheet with my cost accounting homework. Soulver is what I use when I need to do some quick, dirty calculations. Quick, what's $2,500,212 divided by $20,212? I could do that calculation in Numbers or Excel, but it's much faster to do in Soulver. You can also reverence previous lines. For example, I set "Income before taxes" to Line 1 (revenues) - Line 2 (expenses). It's fantastic for short homework problems. That's correct. The above calculations are my net income. I use many more apps, but these are the three I use most for school. It always amazes me that students still use pen and paper in 2014, when there are much better options out there. And it's great preparation for the real world, where you'll be doing all your work on the computer, not to mention that you'll be a much more productive employee out of it. If your excuse for not using technology is that exams are on paper, I say to you, sure, then you will want to do practice problems more efficiently on the computer. You can do three to four problems in Numbers in the same time as you would do one in your notebook. Make the computer work for you. I've been quite busy with schoolwork, "work" work, and learning to code, so forgive me for posting so sporadically. I may not be posting very often, but I've still been consuming all of the latest tech news as vigorously as ever, so all is dandy. Anyway, that's enough of my solipsism. This week we have a small treat from Google, with their 2014 Quarter 1 results. Below is a transcribed (and beautified) income statement. Percentages are mine. Google Q1 2014 Income Statement. Q1 2013 included for comparison. - Items highlighted in red reduce net income. - Items highlighted in green increase net income. - Items in black are totals. Revenues grew healthily, despite what Wall Street skeptics will say. As many analysts have noted, Google revenues closely follow the amount of Google users (due to advertising). For revenues to continue growing, the user base has to expand. The U.S. is saturated already (pretty much everybody is a Google user), so revenue growth will either have to come from 1) international users, or 2) other ways of monetizing current users. It's also worth noting that international users are less profitable than U.S. ones. For every dollar earned, Google spends $0.14 on Research & Development. Google Glass, Google Maps, self driving cars, Android, Google TV, I can go on with other projects Google is involved in. The good part is that they are constantly innovating. The bad is that many, no - most products never leave the lab. Overall, it's great to see a large company spending so much on research and innovation. Looks like it's not stopping. Google spent 31.5% more on R&D this Q1 compared to last year. Large increase in General & Administrative costs. Are they hiring up? Becoming larger and thus less efficient? Hard to say, but the increase is there and worth pointing out. Net Income rose by 3.17%. Not bad, but not exactly stellar performance either. Considering revenues rose 19%, I would like to see net income follow revenue growth more closely. Trim down the fat (SG&A expenses). That said, technology companies are rarely efficient, so this is nothing to worry about, but again, worth pointing out. That's all for now. In the future, I would like to make some comparisons over a longer time period (10 years), but for now, this will do. As always, you can contact me here (I don't bite) or in the comment section below.